MUSEUM CELEBRATES ITS 9TH BIRTHDAY WEDNESDAY EVENING! 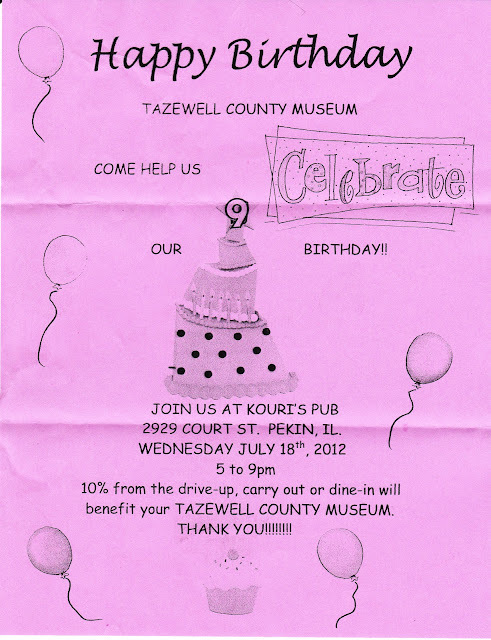 The Tazewell County Museum celebrated its 9th Birthday Wednesday evening at Kouri's Pub in Pekin. From 5-9 p.m. 10% of the proceeds went to the Museum. The Museum would like to thank Kouri's Pub, and everyone who came out Wednesday evening in support. Museum President Christal Dagit was on hand for the celebration at Kouri's Pub to greet those who came to benefit the Museum. The Tazewell County Museum is a not for profit organization, ran strictly by volunteers. If you would like to become a member or donate, please contact Christal Dagit at TCHPC, C/O Christal Dagit, 2950 Court Street, Pekin, IL. 61550. Ginsey Campbell sits at her desk at the Tazewell County Museum Monday morning. While most 9 year old kids are busy sleeping in late, playing video games on the TV, or just doing what 9 year olds would do during their summer vacation away from school, Ginsey Campbell of Pekin likes to volunteer her time at the Tazewell County Museum. Every Monday morning during the summer, and as time permits when school is in session, 9 year old Ginsey does various task at the Museum. Today I found her greeting guest by the front door, but she also helps organize files, and is the Museum's (Guinea Pig) to test out educational programs the Museum develops for school age children. Ginsey is the daughter of Rich and Lara Campbell of Pekin. She will attend 4th grade at Wilson Intermediate School this fall. Her Grandmother Barbara Tidaback also volunteers at the Museum, as well as her mother Lara Campbell. 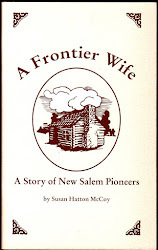 Barbara told me that Ginsey likes (old things). She especially likes the uniformed Doll collection at the Museum. Other activities Ginsey participates in are Kids Club at the Library, plays the violin in Suzuki Strings, Pom Pom Camp, volleyball at the Boys and Girls Club of Pekin, Dancing classes, tumbling classes, sleeping in her antique bed, and she loves to swim. Ginsey told me that she would like to see more children her age come to the Museum and look around. She said its not boring at all. Just to remind everyone, the Museum will be celebrating their 9th Birthday,Wednesday, July 18th, at Kouri's Pub in Pekin, from 5-9 p.m. During those hours 10% of all proceeds will go to benefit the Museum. Kouri's is located at 2929 Court Street in Pekin. Please come out and support your Museum! Ginsey holds up a new item to the Museum, a 1939 Eagle Scout Uniform worn by Virgil A Elliott. It was donated by Marcia and Kevin Elliott. COME HELP US CELEBRATE OUR 9TH BIRTHDAY!! Please come and help us celebrate our 9th Birthday, Wednesday July 18th, 2012 at Kouri's Pub located at 2929 Court Street in Pekin, IL. From 5-9 p.m. 10% from the drive up,carry out or dine-in will benefit your TAZEWELL COUNTY MUSEUM. THANK YOU! !